Our park is situated right on the edge of town so youre close to the countryside but still near enough to town for easy access to local amenities and attractions. The site is nestled in fields which are perfect for long, or short, country walks. Although the walk into town takes around just 10 minutes, a bus service operates allowing residents to be picked up at the park gates and taken straight into Bury. If you choose to walk into town, a path will take you along pretty riverbank next to the river Lark through the Abbey gardens and past the cathedral. The town has a shop mobility scheme in place which makes this route accessible for those who use mobility scooters. Whether youre walking or taking the bus we know youll appreciate the hard work and effort put into Bury in Bloom and be marvelled by how stunning the area looks in all its floral glory. 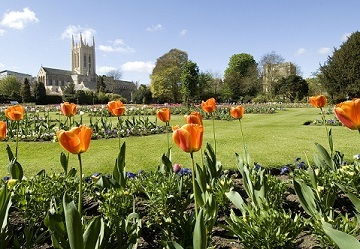 All within 5 minutes of the park you can find doctors surgeries (although more are located closer to the town centre), the Bury St Edmunds LA Fitness Centre (which has a pool, sauna, gym and steam room), and the West Suffolk Hospital. Even Bury Golf Range is just down the street. Youll find both a garden centre and supermarket round the corner and a wide variety of places to eat are all nearby too, well priced to help you enjoy eating out regularly if you choose to do so. Bury Festival  An annual event for all Bury residents sees people travel from further afield to experience the range of entertainment incorporated. The 2011 Festival will run from Friday 20 May to Sunday 29 May and will include a variety of events hosted in various different locations all over Bury. Theatre Royal  Take a guided tour around this elegant neoclassical playhouse and experience what Georgian theatre was like over 200 years ago with one of the many period plays, readings, lectures, and workshops. Suffolk Regiment Museum  First established in 1935 on the 250th Anniversary of the Regiment, this museum displays many diverse artefacts. Since its beginnings, the museum has been relocated and had its displays finally organised chronologically, hopefully not losing, as they put it, the Grannys attic appeal. Clare Castle  Situated in the beautiful countryside setting of the Clare Castle Country Park, this 13th century castle is quite possibly the UKs only remaining example that has a rail station situated in its grounds, built by the Great Eastern Railway in the Victorian Era. Although the track fell into disuse and was removed, parts have been restored and run alongside nature trails. Smiths Row Art Gallery  A contemporary art and craft shop that runs exhibitions, curators tours, and even surgeries for those budding artists out there. The gallery itself is located in a Grade I listed building which was originally designed as a theatre so it retains its high ceilings and light, open spaces  combined with the studio space theres a formula perfect for getting those creative juices flowing. Moyses Hall Museum  Previously a tavern and a gaol Moyses Hall displays a permanent exhibition Faces of Time and runs others alongside it. Presenting a history of West Suffolk from prehistoric times through to present day, this museum even houses an exhibit dedicated to the Red Barn murder. West Stow Country Park and Anglo-Saxon Village  Here you can discover how life truly was for Anglo-Saxons at the reconstructed site where the village was excavated. Visit the homes of Anglo-Saxons, take part in activities and become involved with interactive displays. During special events you can even watch real Anglo-Saxons go about their daily routines. Dunwich Heath  Take a trip to the Suffolk Coast and you might spot one of the many special species that are at home there such as Dartford warblers, nightjars, woodlarks, ant-lions, and adders. Be inspired by the patchwork of heather and dramatic scenery. Orford Ness National Nature Reserve  A short boat trip takes you to the largest spit in Europe, just off the coast at Orford. Take in the stunning landscape and learn more about the areas amazing history. Shopping in Bury St Edmunds  You can find all sorts of stores in Bury St Edmunds  from large chain stores to the smaller family-run businesses providing you with quality goods and locally grown produce. Youre sure to find everything you need.